When I’m not gigging on the last Monday of every month (with the exception of August) I am ever so pleased as it gives me chance to check out the latest Jazz in the Round event. Invariably I am able to savour an embarrassment of riches. The quality of the musicianship is always top-notch whether the players are fresh out of college or seasoned old pros. The latest incarnation of JITR had a distinctly straightahead/boppy flavour to it, though this could hardly be said of John Etheridge’s solo set which wasn’t defined by any particular genre, his free-flowing imagination taking us on a wondrous journey through the entire history of the guitar. 17 days before the gig Ornette Coleman left this mortal coil for the free-blowing band in the sky. 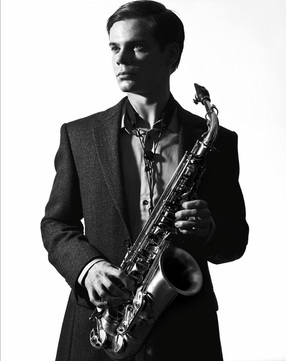 Presenter Jez Nelson decided that it would be an excellent idea to play a few extracts from interviews he conducted with the iconic alto saxman over many years before and in between the three live sets. This was entirely fitting, these nuggets of gold, together some words on Ornette from livelong friend, collaborator and soul-mate Don Cherry adding weight to the cameo. As the audience took their seats in the auditorium the heartbreaking strains of “Lonely Woman” filled the air. Camilla George’s set was lovely, relaxed and warm, just like the balmy weather outside - no alto angst here. It is heart-warming to witness young musicians playing with so much authority, intelligence, imagination and maturity. George is steeped in the bebop and hardbop tradition and has clearly studied and absorbed the musical language of Charlie Parker and Jackie McClean. She is an accomplished composer too. Two of the three numbers were penned by her: the graceful Ellingtonesque ballad dedicated to her father, “Song for Reds”, and the sunny Latin-inflected piece,”Lunacity”, its cheeky “Salt Peanuts” quote guaranteed to put a smile on everyone’s face. I loved the way in which the opener suddenly erupted into “Caravan” after we had been treated to an extended hip-hoppy introduction, first Koleoso, then Casimir and finally Tandy grooving hard. Often, not knowing what the tune is going to be is a boon. “What’s going to happen next?” you ask. Finally, when the head arrives we feel satisfied and can relax. John Etheridge’s solo set was inspired. Before he plucked a note he talked at length about his musical ethos, an ethos that is all about eclecticism and open-mindedness. He is one of the most versatile musicians on the planet, equally at home in the orbit of Django Reinhardt and Stephane Grappelli as he is in the jazz-rock of Soft Machine, the blues of Clapton or the rock of Hendrix. His collaborations with classical guitarist John Williams are legendary. There are few musicians in the world who are able to meld so many seemingly disparate elements into a cohesive, unified whole during the course of a single improvisation. What impresses is the wonderful sense of flow in his guitar voyages. He always seems to be “in the moment” as he journeys into the unknown, the musical landscape forever changing: “Goodbye Pork Pie Hat”, down and dirty blues, Soft Machine groove, Mahavishnu-like fusion, manic prog rock, unashamed swing, tender classical reflection are all part of the glorious technicolored kaleidoscope. Etheridge is a wonderful communicator. He is able to reach people both through the wisdom and lightness of his words and the innate power of his music. The Quentin Collins Quartet is a high-octane unit that speaks the language of hard bop and post bop most eloquently, Freddie Hubbard and Lee Morgan being the most obvious influences on the trumpeter. Of the six tunes played half were Collins creations: the dynamic post-bopper “The Road Warrior”, the bluesy 5-metred hard bop tribute to Horace Silver, “Peace of Silver”, and the balladic trumpet/piano duet “Love’s Labour Lost”. The brilliantly inventive pianist Andrew McCormack started the ball rolling with “Prospect Park”, his own take on Americana, a hoedown full of sudden twists and turns morphing into straight-ahead as the cavalry finally enters. 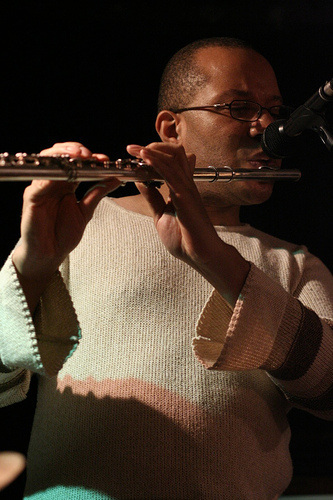 Herbie Hancock was represented in the beautifully lilting “Chan’s Song”, Collins substituting trumpet heroics for a more Kenny Wheelerish flugel horn reflection. The evening ended with a tribute to Monk, Lewandowski conjuring up heaps of bass magic on “Pannonica”, McCormack infusing his muscular and percussive piano work with a fair dose of Chick Corea, recalling the elder pianist’s sprightly and mercurial version of the tune on his early classic album, Now He Sings, Now He Sobs. Another fascinating and stimulating evening of music then from the Jazz in the Round series. I urge anyone who hasn’t been to one of these events to check it out. If you have an open, enquiring mind you will not be disappointed. I reviewed the Jazz in the Round gig for the first time at the end of February. It was a hugely memorable experience – but then every performance I attend there seems to be a special one. Tonight was no exception. “Incredibly diverse” were the exact words used by host Jez Nelson at the end of the evening to sum up the eclectic feast that had just been served up. He couldn’t have been more correct. The sheer variety of styles and genres that are displayed at JITR events is often quite staggering. They say “variety is the spice of life”. Quite true! Usually the live music kicks off at 8pm prompt after a 2-hour DJ set in the bar, the perfect atmosphere to get the throng of jazz and improv revellers in the mood. However, the exodus from bar to auditorium happened a good twenty minutes late on this occasion. There was a very good reason for this. Ubiquitous bass guitar player Ruth Goller had a previous session with Jools Holland, the brief being “get to the Cockpit when you can but make sure you don’t endanger life or limb in the process”. Thankfully, when the band took to the stage at 8.23 pm. Ruth was in one piece. Let Spin is not at all autocratic. Led by guitarist Moss Freed, each player is encouraged to write for the band. It is a band of equals with no voice dominating. Vibey and vibrant, its terms of reference are punk jazz, rock, groove, fusion and freeform. The music boasts a huge dynamic range within this heady mix from meditative calm to angry loud. Goller’s “I Like To Sound Like A Rainforest”, dedicated to the sadly departed bass maestro Charlie Haden, started and ended with a slow rubato unison incantation, the middle section taking us on a headbanging, high octane, rocky journey. Finlay Panter’s “Disa” (tonight it was Dorcik filling the drummer’s shoes) turned out to be a groover with a distinctly Middle-Eastern flavour, the free-form central section intense, wild and dystopian, reminding us that life isn’t always a bowl of cherries. Peace is restored in Freed’s “Rothco’s Field”. The mood might be soft, tender and lyrical but the groove remains omnipresent. The set ended with Williams’ “Walt’s Waltz”, a fiery opus in 3/4 time, as far removed from Johann Strauss or Disney as is possible. Angry and demonic, the music swirls and churns, Zappa-like. Time is abandoned halfway through where all hell breaks loose. The infernal waltz returns but soon three morphs into four as we get slower and slower, grander and grander. Pure drama! Alexander Hawkins is a phenomenally gifted pianist, improviser and composer. He mesmerized the audience with his solo set. There is always a perfect balance between completely improvised and pre-composed material in his work. He also drinks from many musical fountains. As he told Jez: “Sun Ra and Duke Ellington would have been piano geniuses even if they had never run their own bands”. If there were Ra-isms and Ellingtonia in his masterpiece, “Unknown Baobabs”, there was Monk, Jarrett, Cecil Taylor, Charles Ives, Messiaen, down and dirty blues and boogie there too. Hawkins’ fiendish technique is worthy of a Rachmaninov, his occasional double fisted staggered octaves reminding me of the Russian’s classical escapades, though Hawkins’ figures are much angular and dissonant. Elsewhere, he tells his story in the simplest of terms, harmonies completely diatonic for long stretches of time. A short encore was demanded after this breathtaking history of the piano, “Blue Notes For A Blue Note”, dedicated to Louis Moholo, a glorious little postlude – uncluttered, spacious, calming. Hawkins is living proof that it is possible to absorb everything, be influenced by all that one beholds, and yet transcend it all to create a brand new musical language. A Trogon is a colourful little bird which resides in tropical and subtropical forests of the Americas. Africa and Asia. The national bird of Cuba, it’s also the name given by Nick Smart to his Afro-Cuban 6-piece band. Trogon is something of an international band. Though Smart, Montague and Hamblett are English, both Martinez and Ginarte are Cuban, Khan of Bangladeshi origin. Four of the five tunes presented were from their acclaimed album, Tower Casa, the second number up, “The Fishing Grounds” a pulsating triple-time piece featuring a stunning solo from Montague, specially written for tonight’s performance. It followed on organically and seamlessly from the eponymous “Tower Casa”, its majestic solo trumpet introductory declamation setting up the febrile groove from the kicking band, a groove full of unexpected rhythmic and harmonic twists and turns. All the tunes were Smart creations apart from the exciting montuna-infused “Todi Or Not Todi”, written by Khan, its harmonies derived from an Indian scale, though the lovely 8-feel ballad, “Candela”, is actually based on a traditional Cuban melody. Smart pays his respects to Kenny Wheeler in “Everybody Else’s Song”. It’s a re-imagining of Wheeler’s classic tune, “Everybody’s Song But My Own”. As well as composing a new melody line to Kenny’s harmonies, the rhythm has been cleverly transformed into a seven metre. It was yet another inspired evening of music-making: hugely eclectic and massively creative. There was something for everybody and I eagerly await the next event in the series. The “Jazz in the Round” series is one of the most precious jewels of the current London jazz scene. It takes place on the last Monday of every month, with a summer break in August, at Marylebone’s iconic Cockpit Theatre. Those of us of a certain age will well remember the 18-month London Weekend Television series “Music in the Round” presented by Humphrey Burton from The Cockpit which began nearly 44 years ago in April 1971. The show featured performances and interviews with leading musicians and groups across a wide spectrum of music. I was fortunate to be part of this glorious mix in April last year. I found it an exhilarating experience and a great opportunity to shed all my inhibitions and just let the music flow. The latest “Jazz in the Round” was typical of the series’ eclecticism, living up to the website’s description of it being a “barrier-busting jazz/contemporary music binge”. First up was the Samuel Eagles Quartet, a vibrant kicking band comprising the youthful Eagles on alto saxophone, Ralph Wyld (vibes), Fergus Ireland (bass) and the more mature Eric Ford propelling the music forward from behind the drums. Eagles has recently released his first album, Next Beginning on the F-IRE label and has been receiving high praise from the critics. Eagles’ alto swoops and soars with the grace and ease of a flying trapeze artist and his sound is sumptuous. His terms of reference are post-bop, swing, Latin and funk/soul. He writes very attractive tunes, three of which were given a good old workout on the night – “The Place I Live”, “Remembering Myself” and the album’s title track “Next Beginning”. Rowland Sutherland is one of the world’s greatest and most versatile flautists, in huge demand in the fields of classical music, jazz, contemporary, non-Western and popular music. Tonight all the music was written and was mainly inspired by Japanese shakuhachi flute techniques. Rowland informed us that a few months ago he visited Japan where he studied with three shakuhachi players/teachers, the principal master being Yodo Kurahachi 11 who is based in Kyoto. The first piece was entitled “Tsuru-no-Sugomori”, a traditional Japanese tune (translation “Nesting of Cranes”) arranged for Western flute by the Dutch composer/flautist Wil Offermans. It bears a dedication to the late shakuhachi master Katsuya Yokoyama, this particular arrangement deriving from the version that Yokoyama used to play. The second piece was “Honami” (“Wind blowing over the rice fields-creating waves”) written by Offermans for the Western flute but influenced by the shakuhachi. Sutherland created wonderful soundscapes through the amazing flexibility of his lips, tongue, throat and fingers. His flute fluttered and we sometimes heard octaves and chords. He proved that, if Kurahachi and Yokoyama are Eastern masters, then he is the Western equivalent. An encore was demanded. He finished his set with “Winter Spirits”, a solo flute piece composed by Katherine Hoover written for the Western flute. Influenced by Native American music, this evocative composition is inspired by a painting by the artist Maria Buchfink which depicts a Native American flute player sitting crossed-legged playing his flute, totem spirits rising from his instrument. It was nearly time for the headline act: Gary Crosby’s Groundation, but first there was a 30-minute intermission where we all repaired to the bar to converse with old friends and meet new ones. The atmosphere is convivial at all Jazz in the Round events but there was extra joy in the air on this occasion. Before Gary’s band was about to roar, Jez announced that tonight was a double celebration. We were not only celebrating the return of Groundation (it was the first time a band had been invited back since JITR’s inception) but also celebrating Gary’s 60th Birthday. Gary gleefully informed us that the party seems never ending and has been going for weeks now! Groundation consists of Crosby’s bass, Shirley Tetteh’s guitar (Tetteh is somewhat of a regular at Jazz in the Round), Nathaniel Facey’s alto and Moses Boyd’s drums. It is an awesome mix and for the hour long set I put my pen away and just let the music wash over me. Sometimes if you analyse things too much you can lose the point of it all. I think that it’s much more important to lose yourself to the power of the music than to account blow by blow the unfolding musical journey. I was very grateful to Gary for answering a few queries by email a few days after the gig. Some things did stuck in my mind like Facey’s singing through his horn and his incredible gymnastics on his instrument (I thought the singing bit might have been in his tribute to Ornette Coleman, “Ode to OC”, but I was wrong as it was in fact heard at the beginning and near the end of the encore – Crosby’s “Anansi’s Dream”) the powerful rhythmic grooves created by Boyd, Tetteh and Crosby throughout the whole set, the constant flux of the music, the potent blending of diverse genres, the sense of organic development, the perfect balance between structure and freedom and the sense that every performance is created anew. It is wonderful how Crosby lets the music breathe, lets the group members express themselves as they will. It’s never anarchy, though there are often passages of absolute freedom. The music is so grounded and yet the spirit is allowed to fly. Each member is encouraged to write for the band. Tetteh’s “Pinkham V started the set off. It combined Afrobeat with rock and prog rock elements. Crosby tells us that Boyd’s “The Liver Quiver” mixes a driving odd beat bass pattern with a Motown feel. I was enchanted by the leader’s beautiful tune “Dearest”, a dedication to his partner Janine Irons. Facey’s “Ode to OC” had everything. It not only demonstrated what a fantastic player Facey is, a player at the very top of his game, but summed up what Groundation is all about. We heard meditative rubato unisons, everyone speaking with one voice, wild freeform passages, modal swing, Afrobeat, reggae and so on. Within this rich variety there was an ever-present sense of unity and, as in all great music, the whole was greater than the sum of its parts. It was the most wonderful evening. A bonus was my meeting Roger Kneebone, Professor of Surgical Education and Engagement Science at the Faculty of Medicine at Imperial College London, and his wife Dusia. Jazz in the Round is planning a special “surgery and jazz” event at The Cockpit as part of the London Jazz Festival in November. I await this with bated breath and also look forward to more amazing JITR events between now and then.